Therapy Dogs Nationwide is a national Charity where visiting volunteers take their own dogs into establishments to give comfort, distraction, and stimulation. 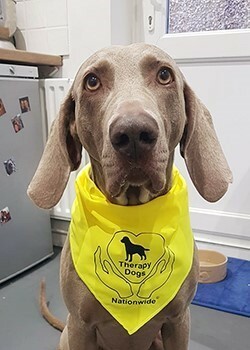 Our volunteers have the unique privilege of volunteering with their own temperament tested Therapy Dogs; some with over 10 years experience and always focused on benefiting people in the community. The use of animals especially Dogs as therapy is not a new idea. Dogs have been used in the care sector for over 40 years. Many of our volunteers have their roots with Lesley Scott-Ordish who was a pioneer in visiting by taking your own pet dog to nursing homes. 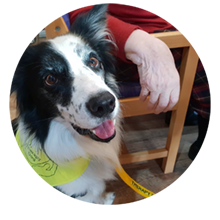 The benefits of Animal Assisted Therapies (AAT) have been extensively studied and the results range from improvement in general health and wellbeing to increased confidence levels, improved and controlled movement to improved communication skills. Volunteers and Therapy Dogs work with a wide group of people within the community. Our work in residential care homes had improved communication in residents and patients by evoking memories and stimulating conversation. Therapy Dogs Nationwide dogs have also shown to help with special needs and autistic children and adults by giving focus and providing a calming environment. We are proud to be part of the Kennel Club Bark and Read Programme. Many of our dogs visit schools to help children develop their reading skills and build confidence. Our volunteers also find their visits very rewarding. More of our work can be seen on our Establishments page. We cover as a volunteer base many different kinds of establishments such as Schools, Special Needs Schools, Hospitals, Hospices, Nursing Homes, Care centres and Prisons. 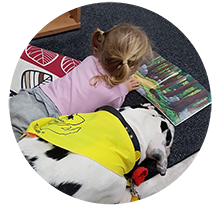 Our Paws & Read programme in Schools is where we work closely with teachers and parents to encourage children to interact with the Therapy dog by reading them a story. 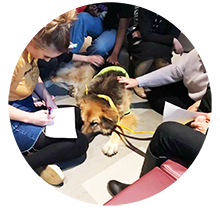 Therapy Dogs Nationwide places temperament assessed dogs with their volunteer handlers into Schools and SEN schools under our Paws & Read scheme which is recognised by The Kennel Club.